The company says “When you’re constantly connected to your phone making seamless transitions between work and play, you need a phone that’s big enough to deal with it all. So we designed the Galaxy Note7 to think as big as you do. For you to get the most out of life the way you choose”. From the above official statement, one could easily understand why the company is making this series of smartphone. This device is made to deal with the big tasks. Over the design, Note 7 has a dual curved screen for the better and faster experience. Note 7 features a 14.39 cm (5.7 inch) display (about 78.0% screen-to-body ratio) SUPER AMOLED capacitive touchscreen with 16M colors. The resolution of the device is 1440 x 2560 pixels with an pixel density of 518 ppi. Its really huge. The company also looked for the protection of the device by adding Corning Gorilla Glass 5 with TouchWiz UI. The device is powered by Android OS Marshmallow v6.0.1 which will soon be upgraded to Nougat v7.0. It comes with Exynos 8890 Octa chipset and octa-core (4 x 2.3 GHz Mongoose and 4 x 1.6 GHz Cortex-A53) CPU with Mali-T880 MP12 GPU. Note 7 has 4 GB of RAM and 64 GB internal memory. There is also a microSD dedicated card slot up to 256 GB space. The company provides a primary camera of 12-megapixels with an aperture of f/1.7, 26 mm, phase detection auto focus, OIS and LED flash. Also, the secondary camera of 5-megapixles with an aperture of f/1.7, 22mm, dual video call and Auto HDR. The camera features 1/2.5” sensor size, 1.4 micro-meter pixel size, Geo-tagging, simultaneous 4k video and 9MP image recording, touch focus, face/smile detection, auto HDR and panorama. The user can record a video of 2160p@30fps, 1080p@60fps and 720p@240fps with HDR and dual-video recording. 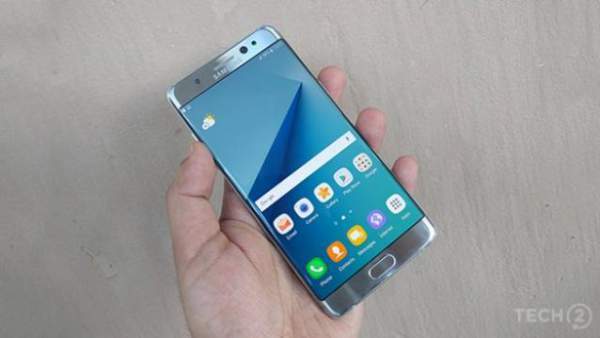 Note 7 also include some common features like Wi-Fi 802.11, Bluetooth v4.2, GPS, NFC, USB v3.1 Type-C 1.0 reversible connector. Also, an audio jack of 3.5 mm is present in the device. The dimensions of the device are 153.5 x 73.9 x 7.9 mm and weighs about 169 grams. Also, company is providing S pen with the product to use the smartphone with ease without touching the screen. Iris sensor, heart rate sensor and fingerprint sensor makes Note 7 wonderful. Another common sensor like accelerometer, gyroscope, proximity sensor, compass and SpO2 are also preset in the device. Note 7 is powered by a 3,500 Li-Po non-removable battery which supports fast charging technology and quickly charges the phones. The device is available in the market in four different colors. The color variants are Blue Coral, Gold Platinum, Silver Titanium and Black Onyx. The device is priced at Rs. 59,900 in India. You can order your Note 7 on an e-commerce website from September 2. Hope you have got all the information right here. For more details, Stay tuned and do subscribe to the website.